PHILADELPHIA (Embargoed until 9:30 a.m. EDT, Tuesday, June 26, 2018) – The addition of fluorine-18 (18F)-fluciclovine positron emission tomography/computed tomography (PET/CT) to the diagnostic work-up of patients with biochemical recurrence of prostate cancer locates previously undetected lesions and changes treatment management for the majority of patients, according to a clinical trial report presented at the 2018 Annual Meeting of the Society of Nuclear Medicine and Molecular Imaging (SNMMI). For the LOCATE trial (ID# NCT02680041), 213 men with biochemically recurrent prostate cancer were evaluated with 18F-fluciclovine PET/CT after having negative or equivocal findings on conventional imaging, such as a bone scan, CT or magnetic resonance imaging (MRI). This first prospective multicenter study was conducted at 15 sites in the U.S., including both private practices and academic settings. It focused on the association between scan positivity and the clinical variables of recurrence site, practice setting, prostate-specific antigen (PSA) level, and Gleason score (system of grading prostate cancer). Questionnaires completed by treating physicians documented changes in management after the PET study. Trial results showed that 59 percent (126/213) of patients had their clinical management changed by findings from 18F-fluciclovine imaging. Of those changes, 78 percent (98/126) were classified as "major" (i.e., a change in treatment modality). Disease was detected in the prostate, as well as other tissue, including pelvic and abdominal lymph nodes and, less commonly, bone. Both positive and negative scans impacted patient management. No difference was seen in the rate of positive scans or in the rate of management changes between private practices and academic settings. In addition, no association was found between Gleason score at diagnosis and positive scans. 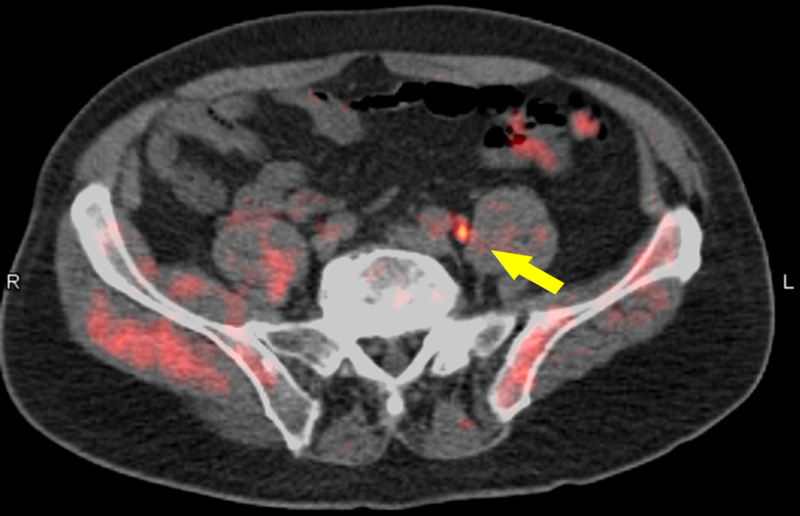 FIGURE: Fused PET/CT 18F-fluciclovine image indicates recurrent prostate cancer in a pelvic lymph node. Credit: Barry A. Siegel MD, Division of Nuclear Medicine, Mallinckrodt Institute of Radiology and the Alvin J. Siteman Cancer Center, Washington University School of Medicine, St. Louis, MO. Abstract 457: “18F-Fluciclovine PET/CT in patients with biochemical recurrence of prostate cancer: Impact on management and associations of clinical variables with scan findings,” Austin R. Pantel, MD, Eleanor Gillis, MD, and David A. Mankoff, MD, PhD, University of Pennsylvania, Philadelphia, PA; and Barry A. Siegel, MD, Mallinckrodt Institute of Radiology. St. Louis, MO, SNMMI’s 65th Annual Meeting, June 23-26, Philadelphia. Disclosure: The LOCATE trial was sponsored by Blue Earth Diagnostics, which manufactures Axumin®, the trade name for 18F-fluciclovine.